Every entrepreneur I know can’t find enough hours in a day to do the good things they want, and yet they often find themselves saying “yes” to new requests. Perhaps because they are optimists by nature, or they just hate to disappoint others, they end up hurting their health, credibility, and effectiveness by not being able to deliver on everything they promise. 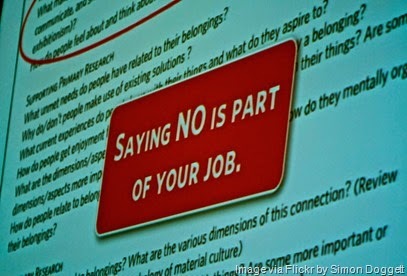 In addition to saying “yes” too often, some entrepreneurs under pressure say “no” poorly, by attacking the requestor or by avoiding any definitive response. Either of these approaches always make a difficult situation worse, often leading to guilt or a later accommodation. Establish boundaries and honor them for all to see.Let your constituents know your priorities and limits. Don’t continually break your own rules about when you are available or what requests are acceptable. Your actions must match your words, so don’t say “yes” when you mean “no,” or hope to squeeze out later. Give credence to your initial instinct.Recognize that your brain and your body often register information that is more accurate than an optimistic emotional reaction, or a negative reaction after a long hard day. Take a deep breath, clear your mind of any external distractions, and analyze your gut reaction before providing any answer. Voice both the pros and cons to a trusted cohort.Speaking the considerations out loud will help you make sure you understand the full implications of either a “yes” or a “no” Every “yes” answer increases your workload, and every “no” answer may cut off an opportunity you need down the road. Talking it out also buys you time. Explore the possibility of a reciprocal favor.This will help the requester understand the impact of the request, and potentially reconsider. In other cases, you may actually get back more than you give up. Every “yes” should be a win-win proposition, just like strategic partnerships can bring huge growth to both businesses, despite the work. Explain your constraints before saying“no.” Rejection without giving a context implies an unreasonable request or a problem with the requestor. People making a request may not understand your budget limitations, current workload, or competitive pressures. In this context, you can also make an encouraging statement about future requests. Say“yes” to the person and “no” to the task. Make sure the requestor understands first how positively you feel about them, despite the fact that the requested task cannot be accommodated in your current workload, strategy, or other boundary. Requestors are then less likely to be left with the impression that your rejection is a personal affront. Sandwich your“no” between two positives. Make your answer more palatable with a positive explanation. For example, if your partner asks you to cover a conference, but you have development deadlines at risk, explain these commitments (first “yes”), how they lock you in town (“no”), and finish by confirming your focus to an on-time product (second “yes”). Defer the decision to a better environment.Ask for the opportunity to discuss the request when you can give the requestor your full attention. When you are in the normal chaos of the startup day, both parties can be easily misinterpreted. Pay attention to body language and tone that often make the negative response more difficult to receive. Make sure your words are non-defensive but clearly stated.No one wins when a requestor reads your softly spoken “no” as a “yes” or a “maybe.” Long detailed explanations are usually read as defensive or confrontational. The answer should be strong and non-emotional. Just say “no” clearly, and smile as you say it. You don’t have to be viewed as a yes person to be viewed as a leader. In fact, if you look at the leaders around you, they are not afraid to say “no” to the conventional wisdom, and they gain respect for doing it. They have learned the art of saying “no” with the same conviction and passion they use in saying yes. That’s the best way to change the world and save yourself, so start today.